Listen to our extended interview with Mayor Tubbs by clicking the play button above. This week, more than 100 Stockton residents will receive $500 debit cards in the mail — no strings attached. It will be their second cash distribution since this city began an experiment in February to test whether offering residents a "guaranteed income" can alleviate poverty. 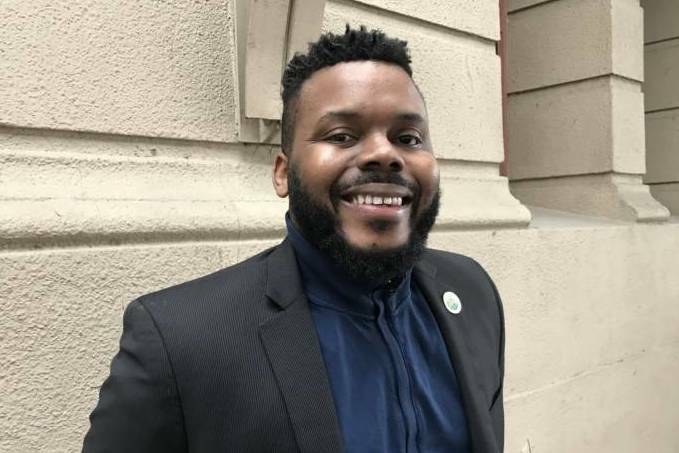 Stockton's 28-year-old mayor, Michael Tubbs, is the face of this test. "I took the step to do the pilot and to be the first intentionally," Tubbs told KQED during an interview in Stockton, where a quarter of residents live in poverty. "As someone who grew up in poverty, who moved up to the working poor, I knew there are a lot of tropes around poor people that are just not true," he said. "I thought I would trust no one else to tell that story and elevate that than myself." Stockton is one of the first cities in the U.S. to run a trial of this size, which will continue for another 18 months. The money goes to a small group of randomly-selected residents who live in neighborhoods where the median annual income is at or below $46,033. Partial funding for this experiment comes from The Economic Security Project, with the goal of testing the viability of a universal basic income. The group is co-chaired by Chris Hughes, one of the founders of Facebook. Similar projects have been attempted elsewhere, including in Canada and Finland. "The argument we've been making is that in the greatest country in the world, no one should not have a floor. I'm not saying everyone should have a yacht or everyone needs to have a Benz. I'm saying everyone should have enough of the basics," Tubbs said. "We're paying for it anyway in hospital visits and truancy and just how much poverty costs us." The idea has garnered support in Silicon Valley, where some tech leaders view it as a way to offset job losses caused by the march towards automation. Support for the idea of a basic income has historically straddled the partisan divide. Civil rights leader Dr. Martin Luther King, Jr. spoke on its behalf. So did conservative economist Milton Friedman who, despite his opposition to government welfare, saw universal basic income as a way of cutting through the patchwork of fixes for those in poverty. Friedman pushed for a rebate that offered the poor just enough to subsist. Critics of basic income schemes say that handing out free money just lowers the incentive for recipients to find employment. But welfare systems where benefits are withdrawn once the recipient finds a job have also been criticized for having the same effect. Mayor Tubbs' vision is to allow residents participating in Stockton's trial to benefit from both a guaranteed income and any additional income earned from a job. A two-year experiment in Finland that just concluded was designed to test the effect of a basic income that was paid independently of whether or not the recipient had a job. During 2017 and 2018, 2,000 unemployed citizens were given the equivalent of $634 monthly. While the study is still being analyzed, initial results suggest that the experiment didn't change the number of people who got jobs. The money, however, did leave people feeling happier. The Stockton income experiment is being watched closely. It's already being raised in the 2020 presidential campaign. Tech entrepreneur-turned-candidate Andrew Yang is offering to give away $1,000 of his own money every month to two families — fittingly located in Iowa and New Hampshire. Whether or not automation causes job losses in the future, Mayor Tubbs said the time is right for his experiment. "One in two Americans can't afford one $500 emergency. Folks are working two or three jobs," he said. "We need to shore up our economic foundation."